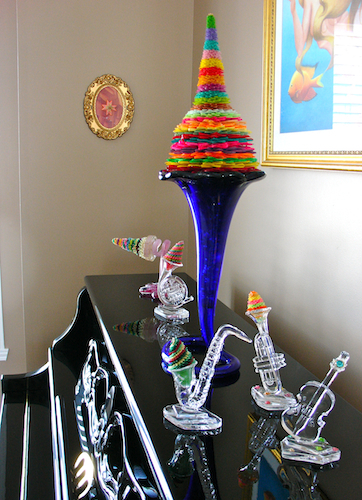 At that time he only had a couple of dozen brightly colored pieces, but now his collection has grown to several hundred. When we settled down together, Leo bought a new cutting board and a roll of paper. 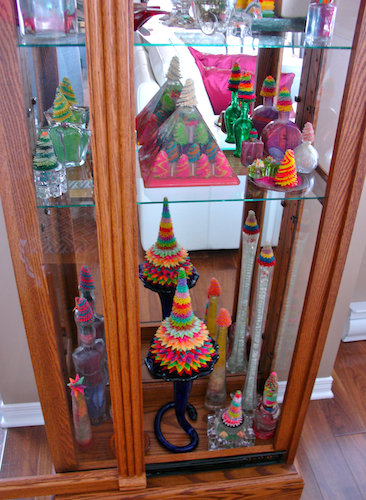 Then he started looking for interesting crystal, glass and other media that could be used as bases for his stars. Whenever Leo had a few minutes, he would always work on his Starlike by weaving and folding strips of paper that he cut with precision on a cutting board in incrementally smaller widths. Then he painted the layers in various hues and blended them together as he built up the star in a spiraling or pyramid-like shape. Some of the larger pieces with multiple layers and colors would take hours, sometimes weeks to complete. As a token and gift to each of his new clients, Leo used to give them a small 3-D Starlike. It was always a pleasure to watch their faces light up as they examined the lovely little stars. One client brought Leo some aluminum paper and, with some difficulty due to the non-pliability of the paper, he built some sturdy stars from that medium. I once asked Leo what he was thinking about as he quietly worked on his stars. He said that he was working at the higher level and that the exercise of making the stars helped him to focus by keeping him busy at the physical level. Working at the higher level means that Leo relaxes while he removes the large groups of spirits that interfere with his clients, sometimes for days and weeks after we’ve worked with them. From the sheer number of Starlike that Leo has made, I know that he has been working hard at the higher level! Each Starlike represents universal freedom and is infused with the Light that Leo uses in his work, as it passes through him and through the Starlike, and makes its way back into the universe. As I’ve mentioned before, with growing knowledge of the Light*, it lingers longer as its positive energy accumulates with the person. In a similar way, with Leo’s highly charged positive energy, each Starlike emanates positive energy. Leo has called for a perpetual cycle of Light to pass through them, so that they will never house negative energy. A cameraman for a major sports news network once visited our home office and exclaimed that he saw our credentials all over the place. In order to present original pictures to brighten up my blog posts, I’ve been featuring some of Leo’s Starlike Art that seem thematic to my material. While I am so very fortunate to have enjoyed Leo’s entire amazing collection of Starlike Art, he are now offering them to the public. Of course, I’ll be keeping those that Leo built especially for me and, although I cherish each and every piece, I’m used to letting them go to bring this positive feeling to their new owners. When a child holds a Starlike that Leo has given them as a present, their face will light up as they ask: “How did you do that?” or “I can have this?” and the more imaginative: “Can I make one of these?” That’s so much fun! Many children see Leo’s Starlike Art as flowers, while many adults see them as coniferous trees. For me, Leo’s Starlikes are reminiscent of some other place in time and space, like vortex portals into another realm of existence ~ a very positive realm.